ROAD TOWN, Tortola, VI- A motor scooter rider was a victim of an alleged hit and run at Paraquita Bay last night, June 26, 2016. According to reports reaching Virgin Islands News Online, the man was knocked unconscious and had to be rushed to hospital. The incident reportedly took place in the vicinity of Bouncer’s Bar around 10:30pm. 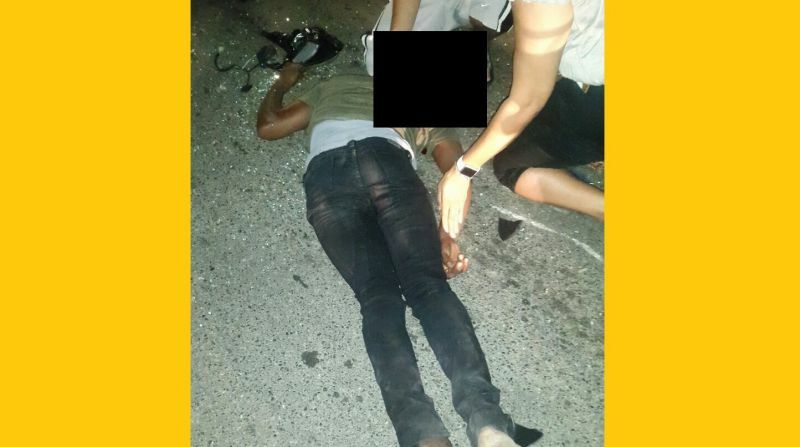 It is not clear the condition of the injured man at this time, however, photos sent to this news site by our Team of Reporters showed the young man apparently unresponsive, lying face down on the road, as persons in the area tried to assist him. No information was received from the Royal Virgin Islands Police Force (RVIPF) up to time of publication. and the best goes on!!! That implies that people only do the right thing when they are caught doing the wrong thing. How about we all take responsibility for ourselves and just DO the right thing!! One of them was about five feet behind me for almost a full minute on the carriageway at normal speed before he could overtake. If I had hit brakes he would have been on my roof. So I guess I would have had to stop and waste hours dealing with a damaged vehicle, the police, gawkers and other nonsense. We lack leadership in the police force. This foolishness must stop. We lack leadership on this, period. I would have probably hit and run too when it comes to these nuisances. They usually ride around with guns as well....So if not badly injured you may end up being the victim with one of them..... Our society and our roads in particular lack any form of law and order. How quickly we forget! Lots of people are blaming the police force for not enforcing laws and policing scooter riders. Yet I distinctly remember the hoopla when they were doing just that! The news blogs were full of comments that they were harassing the riders and they should focus on "criminals". I guess the RVIPF is damned if it does and damned if it doesn't! So they stop enforcing the laws on the scooter riders because of hoopla and news blogs? That's exactly why we say there is no leadership in the police force. Sorry for not having smpathy, but he lay out like he eat a big Sunday meal.. It's about time the government clean up this country.get all these persons who not from here and were criminals where they came from out these virgin islands.get them out of here before its to late.they are a threat to the national security of this island. I guess you would just stand around and take pictures? Get yo ignorant M*******t.
if ya'll would stop being so wicked to each and learn how to get along, stop working voodoo ect maybe this place will be better?? what ya say? ?